There are four more matches left to play before the handball world will know the winners of the Women's EHF Champions League 2017/18. 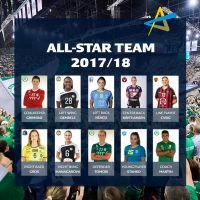 However, on the eve of the Women’s EHF FINAL4 2018 in Budapest, nine players and one coach already celebrate as they have been named the current season's All-stars. Thousands of fans and a panel of selected handball journalists from 12 countries participated in the poll, with their combined votes accounting for 50 per cent each of the final result. The new All-star Team includes three players, who reappear after having been an All-star also in the previous season. One player returns after a three-year break, and six more make their debut in the 'dream team'. Defending champions Györi Audi ETO KC have become the most awarded club, with three names on the final list. Head coach Ambros Martin claimed the award for the fourth consecutive time, while goalkeeper Kari Aalvik Grimsbø was named for the third time in a row. Zsuzsanna Tomori, who is currently injured and will not play at the Women's EHF FINAL4, was awarded best defender. Cristina Neagu from CSM Bucuresti defended the award for best left back for the third consecutive time, while Rostov-Don’s Siraba Dembele returned to the All-star Team as best left wing three years after she had been part of the All-star Team in the 2014/15 season. HC Vardar is represented by best line player Dragana Cvijic, who makes a debut together with five more players. With the exception Metz’s Ana Gros, FCM’s Veronica Kristiansen, Krim’s Tjasa Stanko and Tomori, six All-stars will take the court at the Women’s EHF FINAL4 on 12 and 13 May in Papp László Budapest Sportaréna. In the first semi-final on Saturday at 15:15 hrs, 2016 winners CSM Bucuresti face defending champions Györi Audi ETO KC. At 18:00 hrs newcomers of Rostov-Don take the court against HC Vardar, last year’s runners-up. The 3/4 Placement Match and the final take place on Sunday 13 May and throw off at 15:15 hrs and 18:00 hrs respectively.